4 –Korn & The Dust Brothers Kick The P.A. Mastered at Precision Mastering, Hollywood. Includes exclusive mini-poster by Todd McFarlane. On paper it sounds great - rock/metal heavyweights collaborating with electronic ones. In reality, it doesn't work most of the time. Although rock/electronic collaborations were done before (think Pierre Henry/Spooky Tooth record from 1970, which reportedly wasn't extremely succesful), there was nothing similar done on a massive scale and with so many big names. Also, pairing of musicians might raise some eyebrows. Returning to compilation itself - there are no terrible/irritating tracks, but nothing that stands out either (ok, although i admit that the most well-known track here (Filter/Chrystal Method collaboration) is quite energetic). Aside from that, i have a feeling that a lot of tracks weren't real collaborations, but rather remixes/remakes of originals (especially "For Whom The Bell Tolls" and "Satan"). 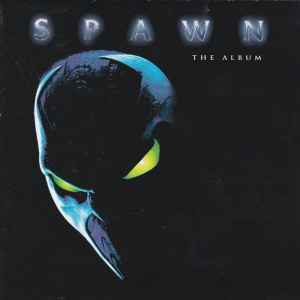 The only track that's missing from most of Spawn copies is collaboration by Morphine and Apollo 440, which i'm not familiar with. But even if it sounds better than most tracks here, i doubt that it might save this soundtrack from sounding mediocre for the most part.